Double occasion! Email pitch approaches anniversary of gathering dust and new mobile phone urges me to explore related stuff. 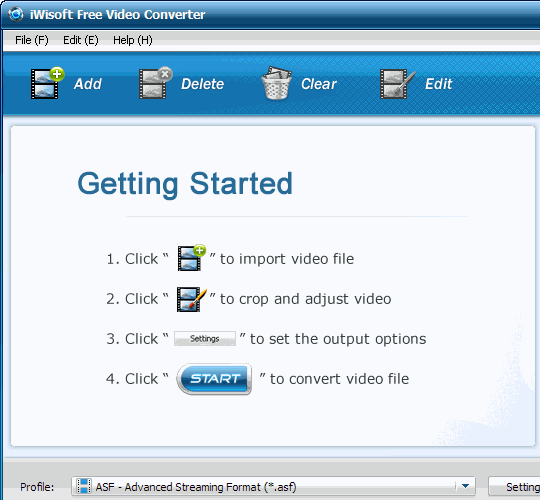 iWisoft Free Video Converter (self-explanatory) converts video files between multiple formats. The task of converting video from container/codec/dimensions X to Y is really very utilitarian. As result there are many software titles for that and what they really compete on is additional functionality and convenience, rather that core function. iWisoft Converter presents itself as solution for many of both input and output formats. Process is very streamlined (pick video, pick output profile) but there is also support for advanced edit, crop, merge and other tweaks. What I liked most is massive amount of profiles out of the box. It has dozens of presets both for specific devices and generic profiles. Any profile can be tweaked and saved as separate entry. I just picked one for Android (labeled Gphone for some reason), changed dimensions and it worked like a charm. App also seems to efficiently use multiple CPU cores. Converting 24 minutes of 720p video took ~10 minutes. One small feature I was especially impressed with is making snapshots from video. Due to technicalities screenshots (or extracting frames) from video has always been total pain. This one makes it seem like no-brainer. Support for flash as input declared as limited and another product from same developer is suggested. Also one feature I would really like to see is burning subtitles into video stream. As it is subtitle track is discarded when converted. Really solid and snappy converter with excellent range of input and output formats. Interesting, now I use XMedia Recode, you know this soft? is iWisoft better? No idea, never used that one.